We all know that money's tight in public services, not least in providing for children with disabilities. It's not surprising local authorities want to avoid shelling out lots of money if they can get away with it. But parents are, of course, just as reluctant to let LAs get away with not providing the education to which their children are legally entitled. There is a high emotional and often financial cost to parents when they're forced to take their LA to the First Tier SEND Tribunal to get that provision. It's also certainly not free for the LA to defend their decision either, especially if they employ lawyers to fight their corner. So how much does it cost council SEND departments? The simple answer is that no-one knows, exactly. Not the Department for Education, not Ofsted. And whilst LA SEN managers will know roughly how much they are spending in their own domains, the costs aren’t always that easy to uncover and pin down. This post is not only about the new tribunal figures, it's about the effort to uncover as close as possible to the real cost of Tribunal for LAs - and that's your money too, don't forget. 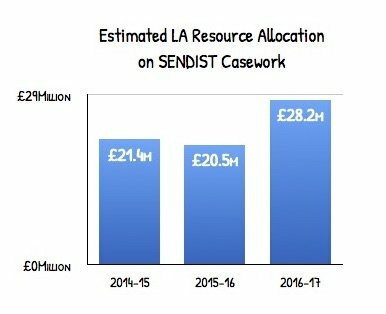 Despite the lack of spending transparency, it’s now possible to put together a robust estimate of what LAs spend on SENDIST casework – thanks in large part to research carried out by the Centre for Educational Development, Appraisal and Research (CEDAR). 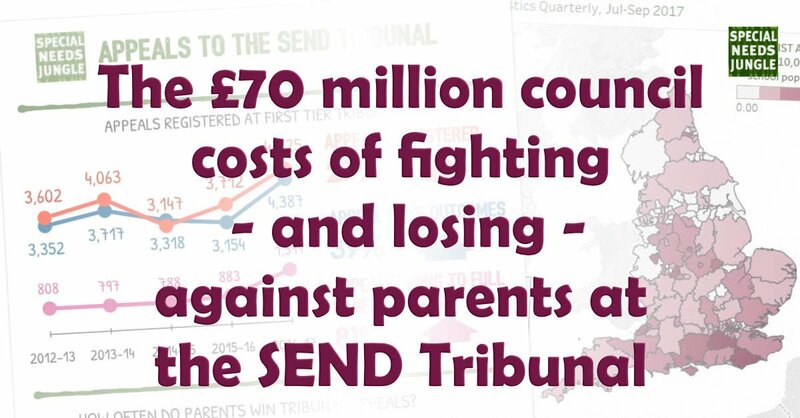 And this research, when combined with this month's new SENDIST case data, indicates that English local authorities have probably used around £70 million of their combined resources to handle SENDIST appeals since the SEND reforms became law in September 2014 – appeals that they lost 88% of the time. So how did we get to this figure? In 2016, the Department for Education commissioned CEDAR to look into SEND dispute resolution agreements. CEDAR published their report in March 2017 – you can find it here, and we wrote an analysis of the report here. As part of their research, CEDAR asked LAs what resources they used to process and defend SENDIST appeals – not just legal costs, but management time, specialist professional time, school staff time, admin costs and mediation services. The researchers then used this survey data to estimate LA resource costs per SENDIST case - varying from around £3,500 for a simple case, through to £11,000 for a complex case that went all the way to a hearing. This is detailed research, but it is still an estimate. In real life, there are some LAs who won’t spend anywhere near this much on a SENDIST case, bumbling their way through an appeal with minimal effort until they either concede, or a SENDIST panel sends them packing. On the other hand, there are LAs who will lavish much more than £11,000 on some SENDIST cases - instructing, as mentioned, external solicitors or barristers, as well as commissioning expert witnesses, and sometimes taking cases to the Upper Tribunal. £70 million is a staggering amount. Particularly when LAs tell you that there’s no money in the system, and especially when you look at the Tribunal figures and see just how few appeals LAs are actually winning – just 12% over this period. It’s painful to consider how much SEND provision £70m could have paid for, or how better off children might have been if this £70m had been invested in better SEND administration. But a cynic would argue differently. A cynic would argue that few LAs realistically expect to win their SENDIST cases. A cynic would say that even if an LA sprays £3,500, £7,000 or £11,000 of its scarce resources on a single SENDIST case, then most of the time it’s still going to be cheaper - for them - than actually meeting the child’s needs right away, right when the child needs it. A cynic would say that this approach to SENDIST is an effective demand management tool that pays for itself - regardless of who actually pays the real price. And a cynic would say that whilst SEND accountability systems fail to learn lessons from this abhorrent waste of public money and human potential, no-one is going to stop this from happening again and again, year after year. There are well-paid people out there whose job it is to hold these cynics to account. These people need to step up and prove these cynics wrong. Just as thousands of parents do, every single year, when they appeal to SENDIST. The statistics speak for themselves: Tania's comments & infographic. Tania says: I made an infographic from the figures Matt pulled out. Click below to enlarge or download a PDF here. 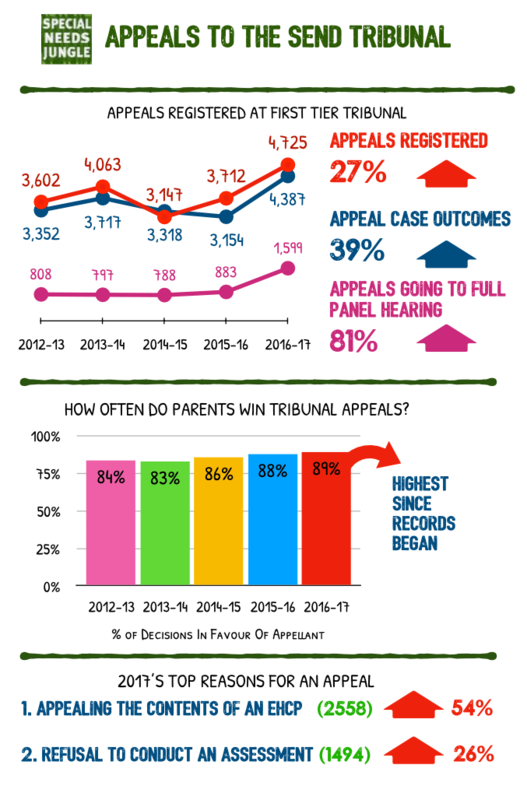 You can see from the infographic that there has been a 27% jump in appeals to the SEND First Tier Tribunal. While it is surely true that the internet, from sites like SNJ to the multitude of Facebook SEND groups, have empowered many parents to appeal instead of just accepting what they are given, they do have to have something to appeal about. And it's easy to see that parents not only had a lot to complain about from the way LAs are operating the post-2014 SEND system, the Tribunal judges overwhelmingly agreed with them. In the past year, there has been a 54% increase in appeals against the contents of a final Education, Health and Care Plan, to a 26% jump in appeals against an LA's refusal to conduct a statutory assessment. It's clear that LAs are not only trying to shirk their responsibilities but they're also getting it horribly wrong when they do accept a plan has to be made. What a shambles! And when parents appeal, it is clear they are not doing so frivolously. 89% of appeals to the FTT are won by parents and carers. I'll say it again: 89%. As Matt showed, that's a lot of wasted money on Tribunals and a lot of precious wasted time for a child's education. Click to enlarge. Copyright: Special Needs Jungle. You may share, download or print this without further permission, but you MUST Credit SNJ. These tables rank LAs not by how many appeals they’ve had overall (on that score, Surrey, Birmingham and Kent are this year’s chumpions), but by appeal rates: how many appeals there have been for every 10,000 pupils in the LA. For the second year running, East Sussex was the LA where parents were most likely to appeal to SENDIST. That’ll come as a surprise to anyone who read the East Sussex Ofsted / CQC inspection outcome letter, which said that “the number of parents finding that they need to access tribunal decisions is significantly lower than in the past” – something that’s very hard to reconcile with the SENDIST data for East Sussex, showing more appeals than ever before. Eight of the LAs in the Top 10 Hall of Shame have already been inspected. We’re still waiting for a report to come out for one of them, but so far, only one of these local areas (Surrey) has been ordered to put together a written statement of action (WSOA), Ofsted / CQC’s most serious sign of disapproval. One other thing that stands out – it’s often assumed that SENDIST appeals are the preserve of the affluent, but some of the counties and boroughs on this Top 10 list are in comparatively deprived parts of the UK. Looking at the other end of the spectrum – the 10 LAs that had the least number of appeals – four had no appeals at all, but two of these four (the City of London, and the Isles of Scilly) are tiny, so we’ve taken them out of this Top 10. Out of the remaining ten, four have been inspected, and two of them have had to write a WSOA. As it happens, those two (Hartlepool & Middlesbrough) both had no SENDIST appeals at all last year. Merry Christmas from SNJ: Here’s some brilliant SEND videos you won’t want to miss! I have been fighting just for education for my son for ten years and two years of that is new law . My lea x 2 think they are above the law, no one monitors them , breach law so many times and laugh in your face by saying well you will have to go to tribunal then but you shouldn’t have to if they have gone an illegal transfer from statement to ehcp we took no part in twice!!! Someone has got to kick the person who created this mess right at the very top as it’s breaking families apart. The cost of tribunal at £3500 to £11000 is worth a punt for a LA. The time taken to argue will save the money they would have spent on provision in that time. Not morally right but financially astute. Need some penalty for this that is more meaningful to the LA. Couldn’t agree more. There is no sanction for missed deadlines or documents that don’t meet legal requirements. If they put providing schooling at a specialist provision off for 12 weeks the money is saved!!! I think you may be right. Publicly my LA, Sheffield, say that they only take cases to tribunal they know they can win, but that is very clearly not true from my Parent Carer friends’ experiences. Last paragraph, in regards to inspections is a devastating reflection of the poor value the inspection regime. We have always said no one scrutinises appeals as a window on good (or bad) practice. It needs to be said – well done again Matthew Keer. Perhaps pcf’s in top 10 areas should receive extra funding and support ? Great report. The use of tribunals or the threat of is, I think, preventative. A retiring LA bod told me once: ‘we fight *everyone* to lower provision, 95% will drop out as can’t face or afford to fight at all, will take what they are given; 5% will fight on but only so far, leaving only about 1 or 2% who we will end up going to tribunal or otherwise settling with’. This was before all the changes by the way, so I don’t think it’s a new law thing, was same with statements. As a dad who didn’t want his ASD kids to go to a residential school I would like to ask what is the cost to LA’s of paying for private residential schools pa? It can vary between around £60k per annum to around £250k and even above depending on the complexity of need that the school caters for.